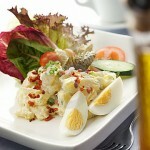 Looking for a healthier alternative to the traditional Potato Salad? Here is a delicious and nutritious option for one of summer’s favourite side dishes! 1. Place the potatoes in a saucepan and cover with water. Bring to a boil. Reduce heat; cover and simmer for 12-14 minutes or until tender. Drain; cool for 30 minutes. 2. 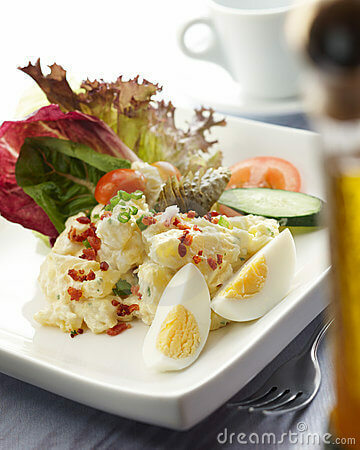 Slice eggs in half (discard yolks or save for another use). Cut the whites into 1/2-in. pieces. 3. In a large bowl, combine the mayonnaise, vinegar, sugar, mustard, salt and pepper. Add the potatoes, egg whites, onion, celery, green onions, red pepper and parsley; toss to coat. Cover and refrigerate for 2 hours or until chilled. Nutritional Analysis: One serving (3/4 cup) equals 110 calories, 1 g fat (trace saturated fat), 2 mg cholesterol, 305 mg sodium, 22 g carbohydrate, 3 g fibre, 4 g protein. Diabetic Exchanges: 1 starch, 1 vegetable. Stay tuned for more healthy alternatives each week!